If you are looking for a convenient way to place and manage static content blocks within your ecommerce store, we recommend you to pay attention to the Aheadworks Custom Static Blocks Magento 2 extension and the Z-Blocks module – its Magento 1 predecessor. Both tools turn working with static blocks into fun, providing benefits of timing and segmentation. As a result, you can display blocks according to a specific schedule to a particular group of customers. Alternatively, content may be shown on a custom selection of pages. In case you are wondering what content types are supported by the Aheadworks Custom Static Blocks Magento 2 extension and the Z-Blocks Magento module, they are HTML, widgets, images, video, plain text, table, and more. Both tools have the same purpose and similar functionality, so we will describe the Magento 2 extension since it fully illustrates opportunities available with both modules. With the Magento 2 static blocks module, you can leverage customer segmentation to decide which store pages should display custom blocks based on a customer group. Custom static blocks can be added to the home, catalog, product, shopping cart, and checkout pages. Besides, admin users can set various conditions to assign a block to the custom selection of products. 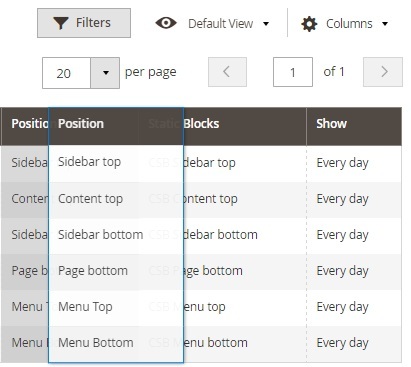 You can also select custom block positions within a page from up to six different options available, including top or bottom of the menu, content area, sidebar, and more. Moreover, the module enables users to create multilanguage blocks for different store views. 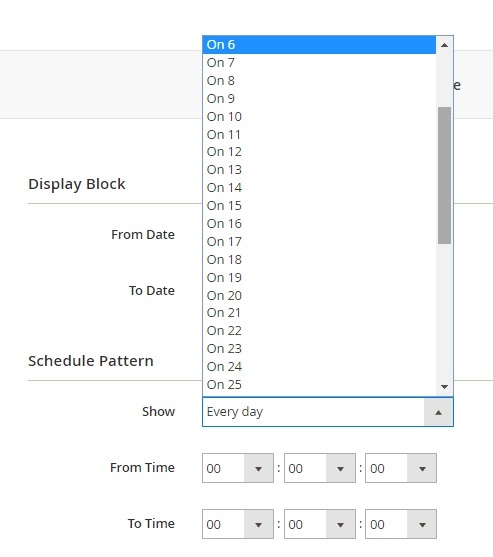 You can also schedule custom blocks display according to the specified days of a month or week and time within these days. To sum up, we want to say that the Aheadworks Custom Static Blocks module provides necessary tools for efficient content management by enriching online shops with appropriate on-page blocks. With the help of the customizable static blocks, you will be able to use targeted communication with your website visitors, save your time using precise scheduling, and increase conversion rates. Below, we will also provide Magento 1 and 2 modules price comparison, but let’s start with the backend and frontend interfaces. 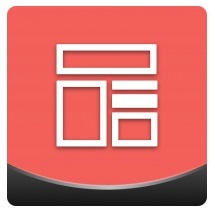 The extension is available under Content -> Custom Static Blocks by aheadWorks. Show (when a block is shown). As for mass actions, you can easily delete several blocks simultaneously or change their statuses in bulk. It is also necessary to mention that the grid is fully customizable. Thus, you can easily rearrange the existing order of columns (it is only required to drag and drop a column to a new place); hide columns that you don’t need (use the drop-down Columns menu); rearrange the order of rows in ascending/descending or alphabetical order by clicking on a column’s header; and apply filters (use up to 8 filters simultaneously). Besides, you can choose how many rows should be displayed per page. 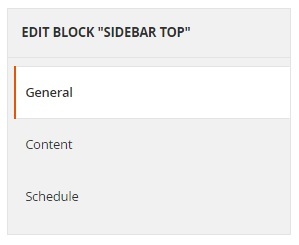 While editing a block, you have to deal with three groups of settings divided into the following tabs: General, Content, and Schedule. On the first tab, you specify general information and choose the position of the block. First, add a name, set a status (enabled or disabled), and select customer groups. 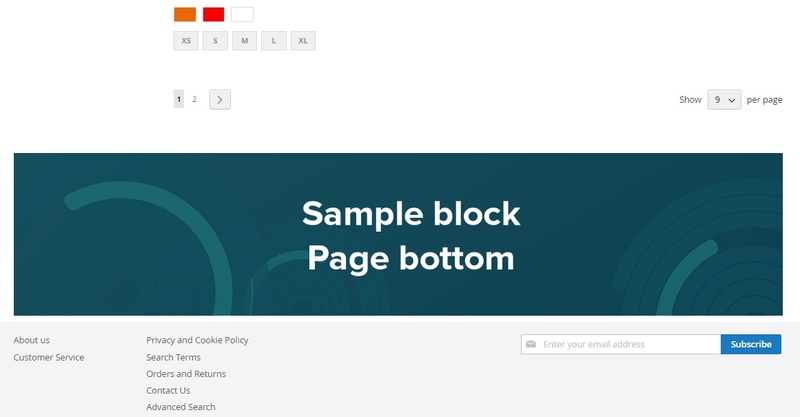 As for the Position section, it enables you to choose where to display the block, and how it should be positioned on the selected page. You get several different combinations of parameters, depending on the first option you choose. You can place the block on home, product, catalog, shopping cart, and checkout pages. 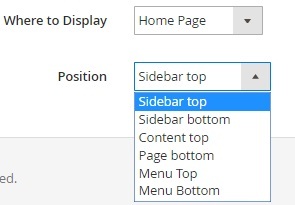 If you choose a home page, it is only necessary to set the block position (sidebar top, sidebar bottom, content top, page bottom, menu top, and menu bottom). For product pages, you choose the position of a block as well and also specify products where the block should be displayed. To display the block on all product pages, don’t specify any products. 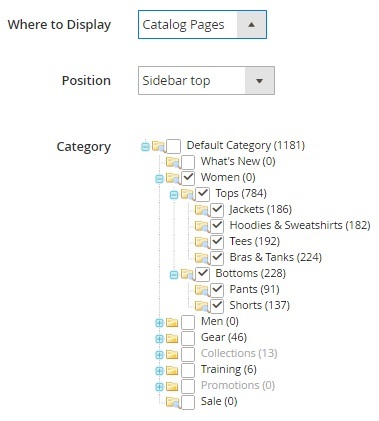 In case of catalog pages, you have to deal with a category tree. Just tick categories where you want to display the block. If you place your block in a shopping cart, Aheadworks Custom Static Blocks extension only asks you to specify its position on the page. No additional options are available for a checkout page. 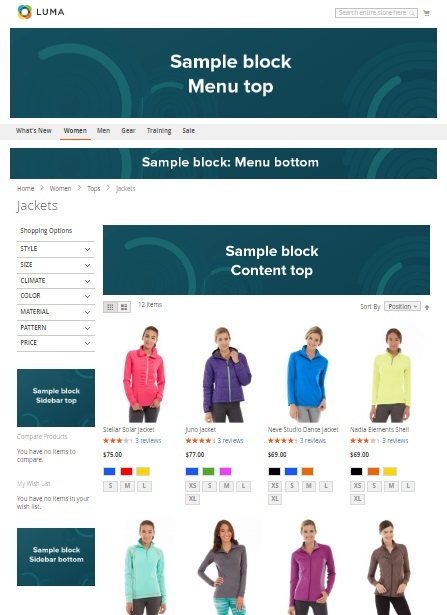 On the Content tab, you choose a store view and add a static block with content generated by Magento. You can select several blocks as well as edit chosen ones. 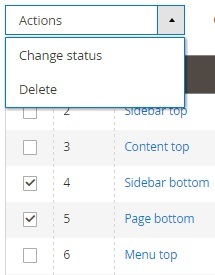 While editing the block with content generated by Magento, you should enable/disable it, add a title and an identifier, choose a store view, and specify the block’s content via WYSIWYG editor (it is possible to disable it and to edit everything manually). As for the Schedule tab, it contains two sections: Display Block and Schedule Pattern. In the first one, you choose a date when the block will appear on your Magento website. Besides, you may specify when it will be hidden. As for scheduling, Aheadworks Custom Static Blocks lets you specify the exact date of a month/ day of a week and time intervals to display the block. Static blocks management is very convenient with both the Custom Static Blocks Magento 2 extension and the Z-Blocks Magento module. Depending on a platform version you choose, Aheadworks offers similar functionality but different price tags. The Custom Static Blocks Magento 2 extension costs $199. For this price, you will get a module itself with free installation, 90 days of support, and personal account manager. Note that the Magento 1 clients of Aheadworks can get a 50% discount, so the price tag may be reduced to $100. As for Z-Blocks, it is almost three times cheaper at first sight, but let’s figure out what’s really going on. For $99 you only get the extension. 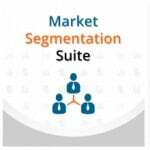 Installation costs additional $55, and there is a necessity to spend $139 more to activate customer segmentation. 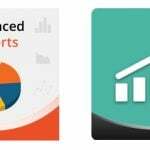 Therefore, if you would like to get the mentioned Magento 2 functionality with Z-Blocks, prepare $293 – an excellent reason to upgrade to Magento 2!